While I admittedly haven't heard a lot by him, Annu Malik has never seemed to me a music director really worth pursuing. 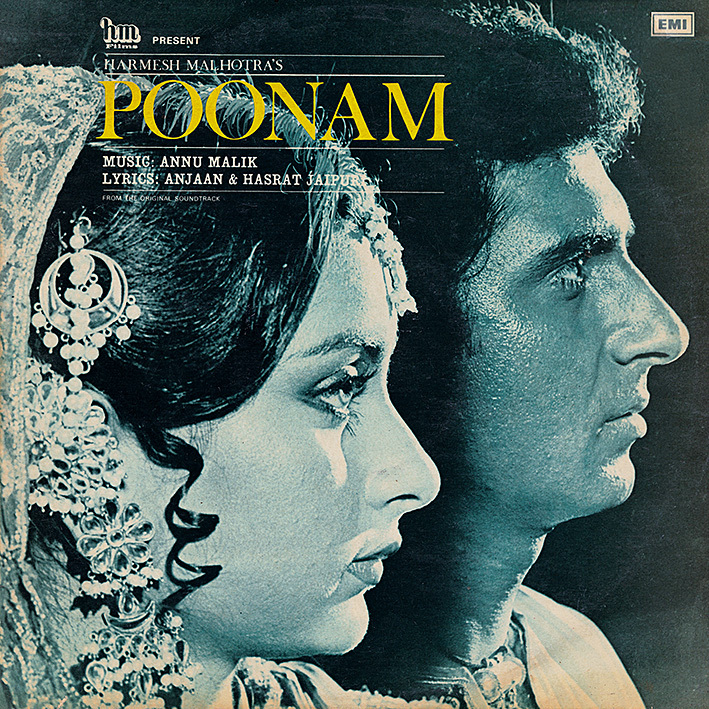 Maybe I'm wrong though... the only other soundtrack I've posted by him had its moments, and to be fair so does 'Poonam'. 'Lagi Lag Jaye' and 'Mahiya Mera Man' are traditional in form and instrumentation but have a percussive urgency about them that is kind of compelling. 'Main Hoon Haseena' has a cool, jazz-poppy vibe and comes with Burmanisms and a hook stolen from Kraftwerk's 'Das Model'. The intro to 'Aa Zara Mere Hamnasheen' suggests a haunting ballad; it isn't but sounds quite pleasant nonetheless. 'Mohabbat Rang Layegi' is charmingly folky, while 'Ham Bhi Jawan Hain' is an attempt at Bappi Lahiriesque disco. Not a bad album at all, but possibly one warranting a few listens for it to catch. There are very few songs by this composer that I like, and even then I think they were perhaps tunes left by his dad, Sardar Malik. He’s responsible for close to 250 scores, so somebody must like him. I’ve only heard two of them, so can only judge those.